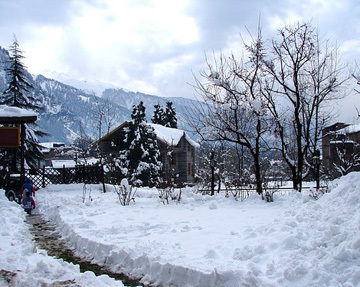 Manali is one of the most sought after hill station in India. It is one of the ideal destinations for a nice weekend as well. This Himalayn resort offers lot many activities to all types of travelers. This tour takes you to the famous landmarks in Manali like Hadimba Temple, the Mall Road, Hot Springs etc. Visit to Rohtang Pass would be a great fun for you. The tour comes with comfortable Volvo bus journey too. Arrival at Delhi at around 6 am and get yourselves transferred to your location in Delhi. • Accommodation in well-appointed rooms as mentioned in itinerary. • Meals at the hotel as specified in itinerary. • Overnight luxury Volvo coach travel for Delhi-Manali-Delhi sector. • 2 way bus terminus transfers in Manali. • Sightseeing as per itinerary by exclusive private vehicle. • Currently applicable hotel taxes. • Any personal expenses, TIPS, porter charges. • Any soft drinks, beer or liquor bills, telephone, laundry charges and expenses of personal nature. • Room service charges and mini bar consumption charges. • Any camera fees, entry fees, additional guide charges. • Any other services which are not mentioned in the package. Itinerary can be changed during the tour due to operational reasons. All activities are subject to be operational due to any conditions, circumstances or weather. Sightseeing services and any other services may be partially or fully canceled and/or amended due to bad weather, heavy rains, natural calamities, local conditions, strikes, political reasons and/or due to any reasons beyond our control. No refund will be given in such circumstances.